During the April school break, TCFA is excited to welcome CircusYoga back for a special three-day workshop, Tuesday thru Thursday, April 15 to 17, 9 to 3pm. Open to kids ages 7 to 14 and built on the theme of “Create and Activate,” the three days will be energetic, creative, stimulating and fun! Mornings will focus on creating circus props to use and later take home. Emphasis will be on use of recycled materials from the community and nature, but also on durable and functional objects. These may include hula hoops, juggling balls, sock poi (simple Maori ball toys), push sticks and more. 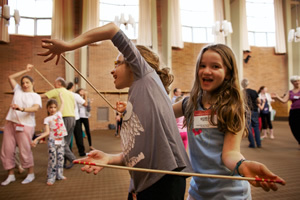 Afternoons will be filled with CircusYoga games and skill-building for collaborative and playful activities—acrobatics, plate-spinning, clowning, invention and more. The final day will include a short presentation of prop creations and circus skills for families and friends, with a chance to try out the new props and learn from the kids. Cost thru Tuesday, April 1—$170/TCFA members—$140. From Wednesday, April 2 thru Wednesday, April 9, fee—$185/TCFA members—$155. Registration closes Wednesday, April 9. To register, families should fill out this form contact Cori Vogel <corivogel@gmail.com> or 607-387-3717. Space is limited so early registration is encouraged!